In this lesson, we will learn how to express a vector in component form given its initial and terminal points. Find the components of the vector  𝐴 𝐵 , where 𝐴 = ( − 4 . 5 , 1 . 2 ) and 𝐵 = ( − 4 . 5 , 5 . 7 ) . Find the coordinates of the terminal point of the vector in the given diagram. Find the coordinates of the initial point of the vector in the given diagram. Find the components of the vector  𝐴 𝐵 , where 𝐴 = ( 1 . 5 , − 0 . 3 ) and 𝐵 = ( − 1 , 5 ) . A vector has components and a terminal point . What is its initial point? Suppose the coordinates of points and are and respectively. 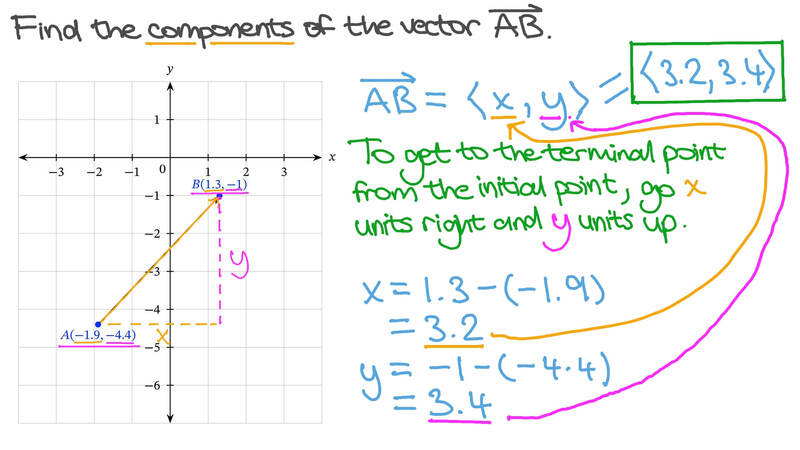 Find the components of the vector in terms of , , , and . A vector has components and an initial point . What is its terminal point? 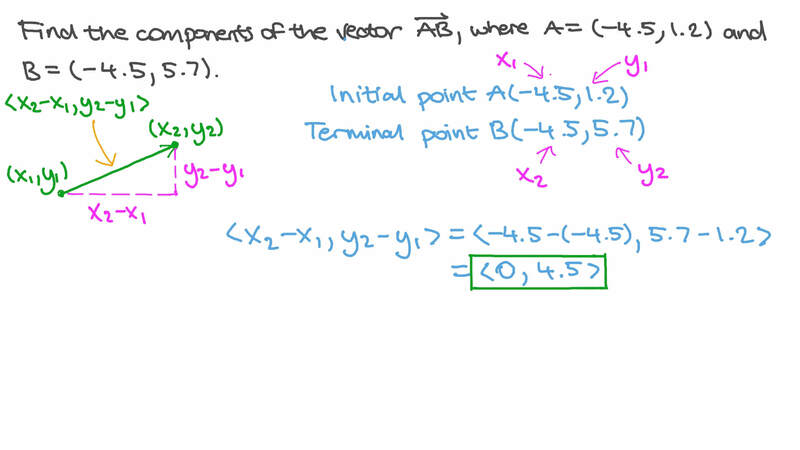 Find the components of the vector , where and . Given that the coordinates of 𝐴 and 𝐵 are ( − 1 2 , − 2 4 ) and ( − 3 , 1 6 ) respectively, find ‖ ‖  𝐴 𝐵 ‖ ‖ . What is the magnitude of the vector  𝐴 𝐵 , where 𝐴 = ( 9 . 1 , − 2 . 3 ) and 𝐵 = ( 7 . 7 , 2 . 5 ) ? Using the shown graph, determine the position vector of point 𝐶 relative to the origin point 𝑂 , denoted by  𝑂 𝐶 , and find its norm, denoted by ‖ ‖  𝑂 𝐶 ‖ ‖ .